In this paper we present the edited testimonials of caregivers of subjects who received sulforaphane as part of the original study (published in 2014). Sixteen caregivers of subjects originally given sulforaphane responded to requests for further information. Six of the 16 subjects did not continue taking a supplement after their participation in the original study ended. Years after the study ended, 9 of them are still taking a dietary supplement that delivers sulforaphane. Dr. Fahey recently talked about the edible tropical tree Moringa on SmartDrugSmarts, with host Jesse Lawler and Lisa Curtis. 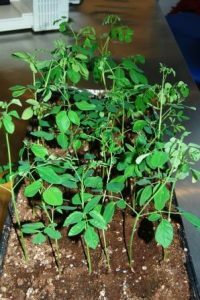 In this 38 minute podcast Fahey discussed research on Moringa at the Chemoprotection Center, including their plans to evaluate it in the clinic. Last week, Dr. Fahey talked about sulforaphane on SmartDrugSmarts, in the central half hour of this 44 minute podcast. Type 2 diabetes is becoming increasingly common worldwide, and not all patients can be successfully treated with the existing drugs. We have just co-authored a publication with a leading Swedish research team at the University of Gothenburg and Lund University. In today’s paper, and the extensive supplemental material that goes with it, the pattern of gene expression associated with type 2 diabetes was analyzed, and compared to the gene signatures for thousands of drug candidates to find compounds that could counteract the effects of diabetes. The leading candidate from this analysis was sulforaphane, a natural compound found in broccoli and other vegetables. Sulforaphane inhibited glucose production in cultured cells and improved glucose tolerance in rodents on high-fat or high-fructose diets. Moreover, in a clinical trial, sulforaphane-containing broccoli sprout extract was well tolerated and improved fasting glucose in human patients with obesity and dysregulated type 2 diabetes. A viewpoint on “superfoods” in the Johns Hopkins Health Review. A lecture on Moringa at an agroforestry symposium in Missouri. A review of the medical evidence supporting the use of Moringa oleifera. A short feature on our Moringa work in the Johns Hopkins Magazine. 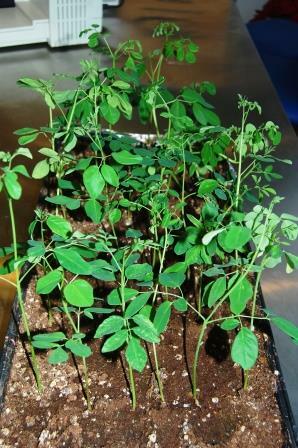 A scientific publication on variations in protein and mineral content between species and cultivars of Moringa. Moringa oleifera, the most commonly farmed species, produces edible leaves that are unusually rich in protein, iron, calcium, nine essential amino acids, and Vitamins A, B, and C. Its seedpods, which are as thick as the meaty part of a drumstick and about a foot long, are also high in protein and omega-3 fatty acids.